After a defendant has been arrested for a domestic violence offense, he or she may be served with a variety of different protective orders designed to prevent the defendant from having contact with the named victim or committing any future acts of violence, threats or harassment against that person. Other than the emergency protective order which can be issued by the police at the time a defendant is arrested, there are two types of protective orders that may be issued against the defendant; a criminal protective order that would be issued at a defendant’s arraignment and a domestic violence protective order that a petitioner may request independently of any criminal case in civil court. Under California Penal Code Section 136.2 PC, the Court will typically issue a protective order against a defendant who has been charged with a crime of domestic violence. The protective order may prohibit any contact or may be a “Level One” protective order that allows peaceful contact between the parties. The defendant would be required to relinquish any firearms within his or her possession and would be prohibited from owning or possessing firearms while the order is effective. 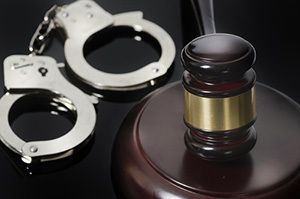 The criminal protective order is typically issued at the time of the defendant’s arraignment and the defendant may be required to personally appear in court in order to be formally served with a copy of the order. In many cases, the prosecution may request a criminal protective order even where there is no domestic relationship, such as elder abuse cases under California Penal Code Section 368 PC where there is no family relationship between the defendant and the elder victim. In these cases, an experienced attorney will be able to argue against imposition of a criminal protective order as a condition of release as it would not be authorized by law. The named victim in a domestic violence case may independently request a domestic violence restraining order by filing a petition in Civil Court. The filing fee is generally waived for petitioners requesting domestic violence restraining orders. The Court will schedule a hearing for the domestic violence protective order and the petitioner would have to serve the respondent with the petition and notice of the hearing date. The Court may issue a temporary restraining order that would remain valid pending the outcome of the restraining order hearing. The defendant, who is referred to as the respondent in civil court, can contest the restraining order and can be represented by counsel at the hearing. The Court will generally allow the respondent to continue the restraining order hearing until after the criminal case has been adjudicated. At the hearing, the petitioner must prove his or her case by a preponderance of the evidence. This is a lower standard than is required in criminal courts, where the prosecution must prove guilt beyond a reasonable doubt. The petitioner is allowed to present evidence and testimony and the respondent can cross-examine the petitioner and also present evidence. Ultimately, the judge will determine whether or not there is sufficient evidence to grant the order. If granted, the respondent may be ordered to complete a 52-week batterer’s program. If you or a loved one have been arrested for domestic violence or have been served with a domestic violence protective order, it is crucial that you meet with a skilled domestic violence attorney immediately. As a former Deputy District Attorney with over 14 years of prosecutorial experience, Michael Kraut understands the implications of a protective order and works hard to ensure his clients receive the most comprehensive defense possible. For more information about domestic violence protective orders and criminal protective orders, and to schedule your free consultation, contact Michael Kraut at the Kraut Law Group located at 6255 Sunset Boulevard, Suite 1480, Los Angeles, CA 90028. Mr. Kraut can be reached 24/7 at 888-334-6344 or 323-464-6453.